I'd never been a big fan of the Caribbean. Not that I'd seen a lot of it, but I had been to Nassau in the Bahamas, and to Charlotte Amalie in the USVI, and to Road Town in the BVI, and lately to Marigot and Philipsburg on St. Martin. All these tourist towns left me slightly depressed. I can't say why, exactly, but they did. 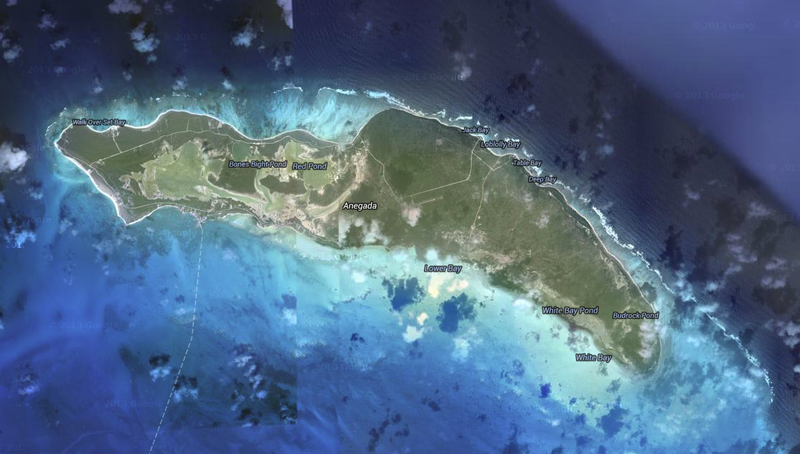 Not so Anegada. Picture the sweep of a white sand beach, backed by palm trees and a couple of tiki-bars. That's it. Few roads, fewer cars, and practically no where to go. But the people and beaches... beautiful! Helena and I were determined to have a day to ourselves. Eric is a great sailor, but a tourist he is not. 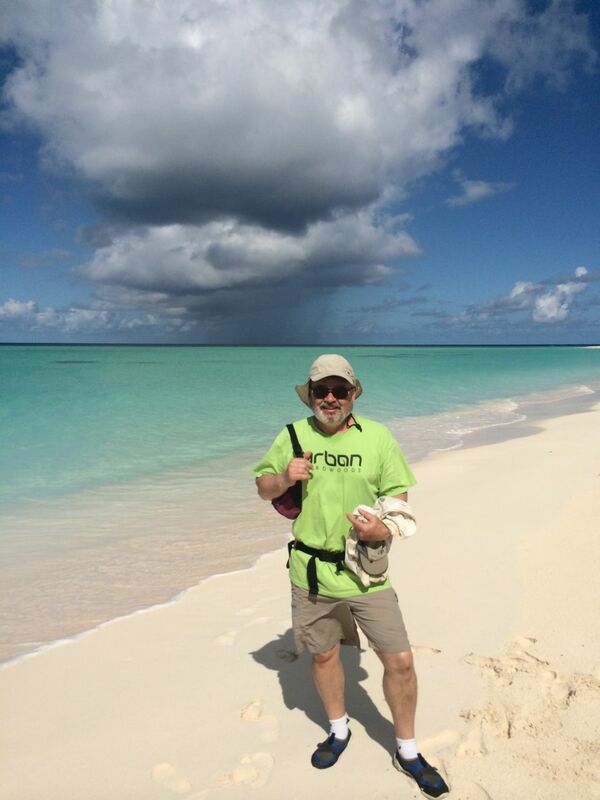 He could have seen the whole of Anegada in 32 minutes, bingo-bango. We wanted to savor the visit, and Eric was just as happy to skip our little tour of the island. So, after hitching a ride ashore in the dinghy, we made our way to the car rental shack, where I realized I'd forgotten to bring my driver's license, or indeed any form of ID. Oddly, this wasn't a problem. I guess it would be hard to steal a car on a tiny wind-swept island, but mainly, people are just very, very relaxed on Anegada. We were soon on our way. I'd driven on the left side of the road before in England and Australia, where they actually have traffic to worry about. On the island's deserted roads? No problems, mate! On the other hand, both the car and the road were in awful shape. You could hear the ball joints rattling over the bumps. The car was clearly on it's last legs, but I thought I could nurse it around the island once, probably. Then the pavement gave out and the road got even worse. Helena spotted a trail leading off through the dunes. We drove up it until the wheels threatened to sink into the sand, then parked the car and walked. Wow... what a beach. Most beautiful scene in the world. And the beach wasn't bad, either. After a swim and a walk on powder-soft sand, we got back in the car and rattled on down the road. The island was hardly developed at all. Just a few isolated houses on the beach, and practically nothing inland. No cars on the road. If we broke down, it would be a long, hot walk back to Fiona. Just about the time we were getting thirsty, we found a sign for a place called the Cow Wreck Bar. At 10 a.m., the place was deserted, except for the owner and her grand daughter. We took another walk on the beach, held hands, got our sun for the day, and retreated to the bar's shade and breeze for the first drink of the day. By then, I was ready to move in to one of the Wreck's tidy little beach bungalows, and never leave. But we were getting hungry and decided we'd drive around the island and eat at the best place we found. Oh, the optimism that comes from early success! To make a long story short, we circumnavigated the whole island, and realized the Cow Wreck was the best place on the island, if the least promoted. After touring the only town on the island, and discovering it to be even more distressing than the usual Caribbean town, we hurried back to the Wreck where we had a fantastic lunch, many drinks, and got a bit sunburned, despite the shady palms. A glorious place. Upon returning to Fiona in the early evening, I was ready for a nap, but Helena was ready for a swim. 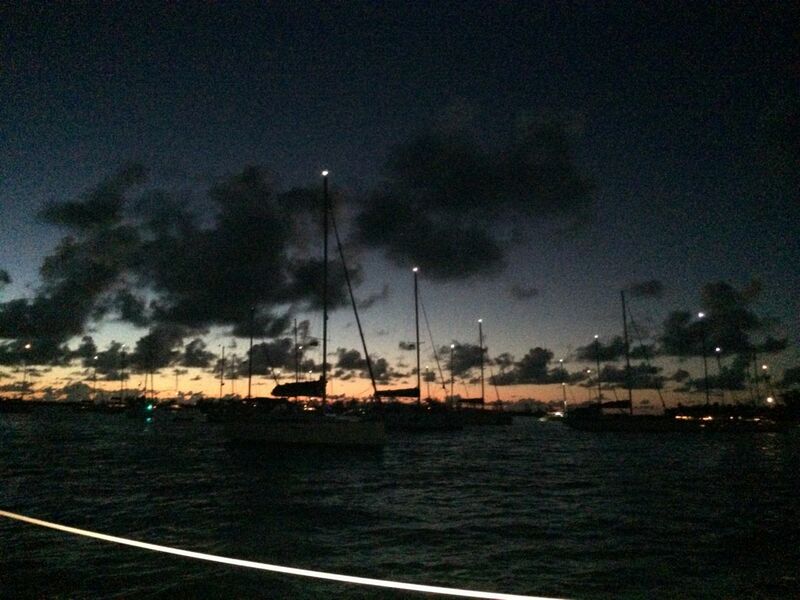 We were anchored in 18-feet of water amongst many, many other boats. I was a bit anxious that Helena would be run down by a speeding dinghy, but she pooh-poohed my fears and swam off towards the closest boat to go visiting. After saying hello to crews on several boats, she eventually found a friendly British couple, and invited them over to Fiona for cocktail hour. I was just glad to get her back on board. The day ended with a beautiful sunset, or as Eric said, with a slightly ironic sigh, "Another beautiful sunset!" 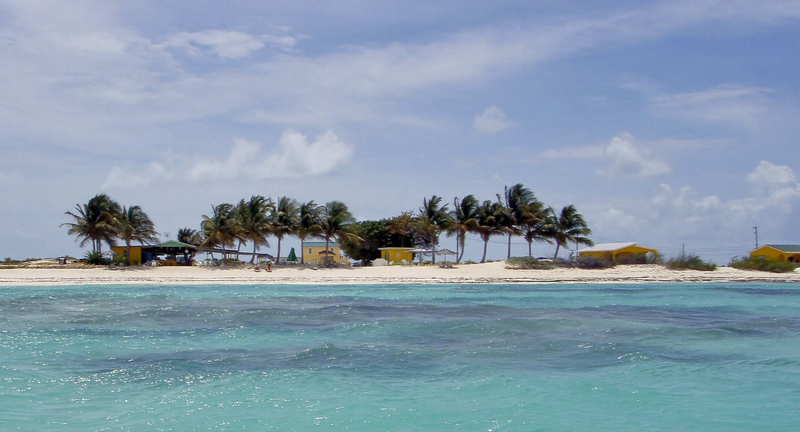 Anegada. Wow, what a beach! Anegada is a very funny word in Portuguese, so I went to the locals and asked where the word came from. It happens to be from the Spanish work meaning “flooded land”. Flooded in Portuguese is “alagada”, so it’s close enough to be mistranslated by the British. We left Fiona early morning with a plan to circumnavigate the island. It’s is too far to walk, but we had options of renting a bike, a moped, or a car. I was excited about renting a moped, I have never driven one, and it sounded like fun. John decided mopeds were too dangerous and we were renting a car. Period. As we approached the rental place we realized how fully we'd switched to 'island thinking'. Neither one of us had thought to bring a driver's license, credit card, or passport. Were we out of luck? We rented an old Hyundai. It didn’t sound that good and we were afraid that it would lose it’s wheels at any moment. John drove very, very slowly, on the left (i.e. wrong) side of the road. Max speed around the island is 30 miles/hour. The whole day, we met only two other cars. We set off at 9 a.m. It was already hot, and the sun blazed down with no prospects of letting go. We decided to go around the island clockwise. After about two miles the paved road ended and white sand became our new trail. If we'd been riding mopeds, we would have had to turn around. The road was heavily 'washboarded', meaning there were bumps every few inches, like an old washboard. Driving fast was not an option and the speed limit a joke. If John drove faster than 20 miles/hr, the tires bounced alarmingly. He mainly kept the speed around 5 knots... Fiona speed. 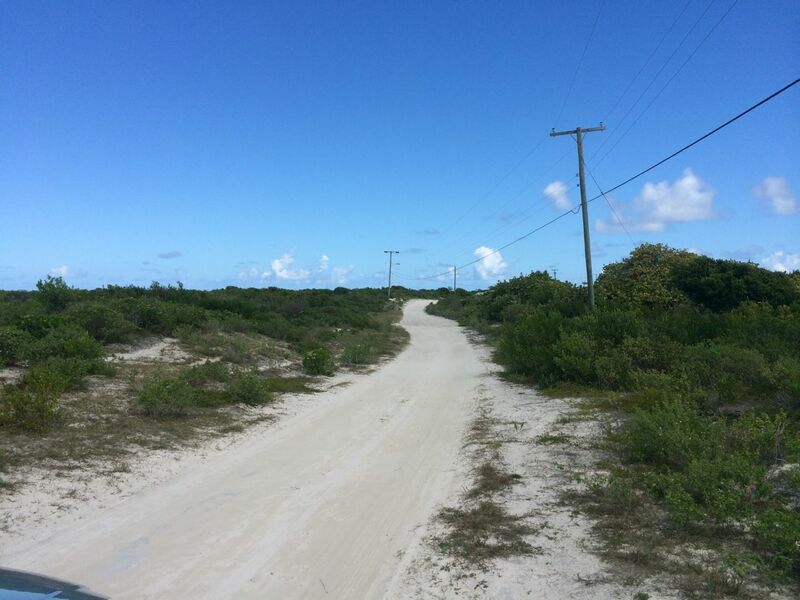 Taking a risk, we veered off the main sandy road onto a much narrower and even more sandy road. The car tires complained of too much sand and we proceeded by foot. It was well worth it. Over a slight dune John and I found ourselves on a deserted beach. Our footprints (the first ones, ever, on that beach, I am sure), sunk into the flour-like sand. It was an amazing feeling. Afterwards, we drove to what ended up to be the best spot on the island, although we didn’t realized it until we returned to it, four hours later. The Cow Wreck bar. Right on the beach, nice breeze, gorgeous views, affordable drinks and a happy staff, oh, and no tourists either. We had a walk on the beach, and a pre-lunch drink to fortify us for the rest of the journey, then carried on. We followed a map looking for native pink flamingos and large iguanas, but without any luck. The reefs that surround the island are a great attraction for snorkeling and diving. After driving for a couple of hours trying to find “the” ideal place for lunch, and finding mainly over-priced tourist traps, we ended up back where we started, and realized we'd already found the best place, and drove back to the beautiful Cow Wreck Bar. We spent the rest of the day there, enjoying the view, the food, and the good company. When at last we returned to the dock, Eric was already at the bar, enjoying a happy hour drink and ready to take us back to Fiona. Once back on board Fiona, I went for a swim and met the crew of several anchored boats. After returning to Fiona, I spotted a huge turtle, just a couple of feet away. Funny how they can stick their head above the water to “check things out”. I am glad I didn’t see her while I was swimming! Tomorrow, we are off to Jost van Dyke Island, belonging to the BVI, 20 miles away. Sounds like you had a wonderful day. 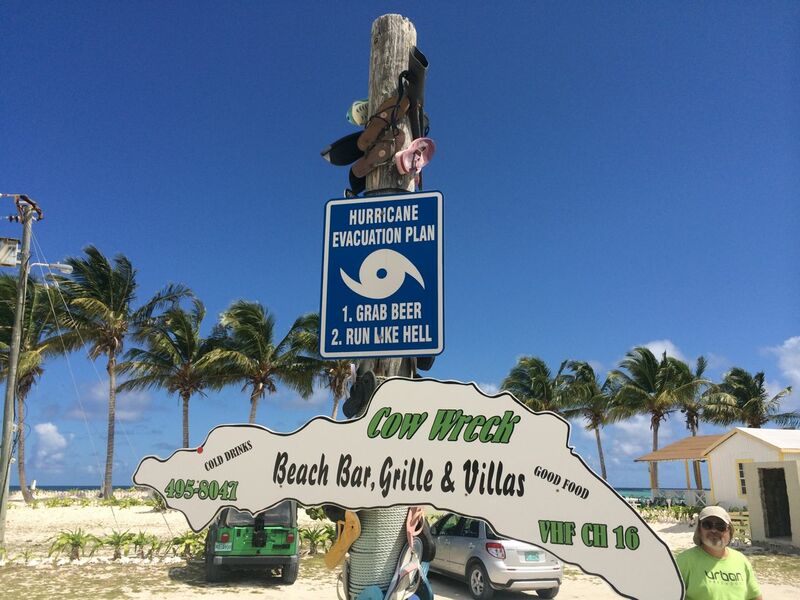 I loved the hurricane evacuation sign "Grab a beer and run like hell".